Although slightly silly at times, and failing miserably at curing neuroses, Richard Neutra’s psycho-physical work offers an early insight into the often awkward relationship between architecture and psychology. Austrian-American modernist Richard Neutra (1892-1970) articulated a peculiar type of therapeutic architecture. Influenced by developments in modern psychology he insisted his designs could cure his clients from neuroses. His vision became popular on the American west coast and particularly within Hollywood, caught as it was in the slipstream of Freud’s psychoanalysis. Although slightly silly at times, and failing miserably at curing neuroses, Neutra’s eclectic modernism offers important insights into the relationship between architecture and psychology. In 1929, four years after he established himself as an independent architect on the west coast, Richard Neutra completed his masterpiece, the Lovell Health House. Nested in a seemingly impossible to reach location in the Hollywood Hills the house offers a spectacular view of the city of Los Angeles and a tempting glimpse of the ocean behind. All this is brought to the fore by the house’s geometrical scheme of straight lines and glass, at the time a novelty for the West Coast, as was a construction made entirely out of steel. The analysis that lay at the heart of the design was also particularly innovative. This young architect, who had a preoccupation with the human psyche and a vision about the way his houses could affect its condition, followed the behaviours and motivations of the Lovell family in minute detail. The house was called Lovell Health House for a reason. It contains an open-air fitness suite, rooms for sunbathing and sleeping out in the open, and various dietary and therapeutic services. Upon its completion an organized tour attracted a huge crowd. Around 15.000 visitors made their way through the house to marvel at the modernity of it all. Yet most of them were unable to see how anyone could actually live in it. The house was unlike anything they had seen before, the style entirely new and strange. ‘Moon-architecture’, one of the visitors was said to have muttered. In a black-and-white photograph from around that time the house can be seen lying at a distance, half sunken into the hills. To the contemporary observer it must have looked like some kind of futuristic research institute, a place where people in white coats worked secretly on speculative projects. The house breathes the spirit of the age. It was the breakthrough the young architect had hoped for. Department of Special Collections, Charles E. Young Research Library, UCLA. Neutra rose to become the main representative of the International Style in North America, and in the thirties, forties and fifties he built a large number of houses for private clients on the West Coast. The man had some striking ideas about the movement, convinced as he was that his houses could affect the psyche of their inhabitants. In itself this was not a remarkable sentiment in a period where psychology permeated society, but Neutra took it one step further: he believed that he was able to cure his clients from neuroses through his houses. The key to this cure, he argued, lay in a fluent relation of interior and exterior. His aim was not a seamless connection of architecture and landscape, á la Frank Lloyd Wright, but an unlocking of the mental interior of the inhabitants. Neutra believed he was able to destabilize the barriers between the psyche and its natural surroundings in such a way that psychic energy would be allowed to float freely. To be sure Neutra was not the most innovative of modernist architects, nor was he the most famous. But what was unique about his work was the relation it entered into with a ‘new’ form of science: modern psychology. As a student Neutra was fascinated by the Principles of physiological psychology, the seminal work by Wilhelm Wundt which defined psychology as an experimental science. Wundt’s ideas shed a completely new light on the ways in which human consciousness is connected through the senses with the environment, and it is precisely this connection that Neutra was interested in. Splitting up the mystery of consciousness into comprehensible parts, and reducing these separate mental functions to sensory and neurological processes, fitted perfectly with modernist ideas of function and standardization. Modern psychology provided Neutra with the tools to design the optimal psycho-physical connection – at least, in theory. 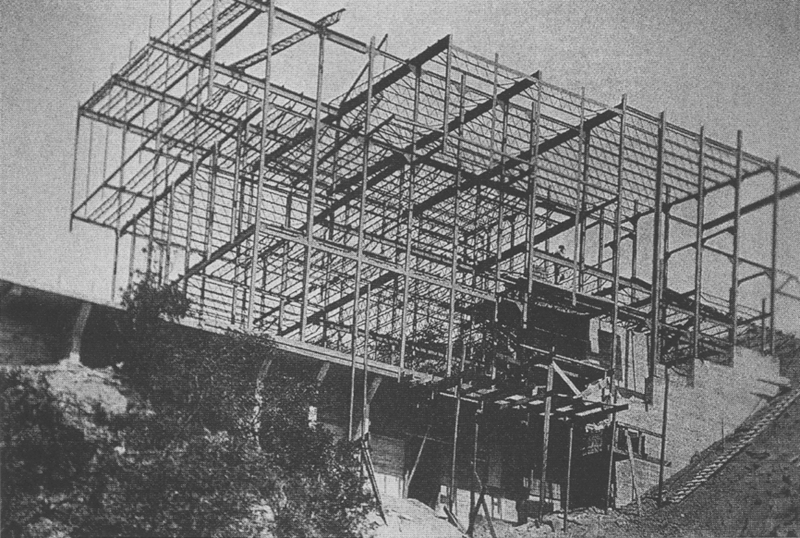 Lovell Health house, construction site, 1928. In fin de siècle Vienna, where Neutra was born and raised, there was another branch of psychology on the rise: Psychoanalysis. From the moment he befriended Sigmund Freud’s eldest son, Neutra became a regular visitor to the family house. He was deeply impressed by Freud’s ideas about the unconscious, in particular by the idea that repressed psychical energy finds its way to the outside world through projection – this notion would strongly impact his later practice. 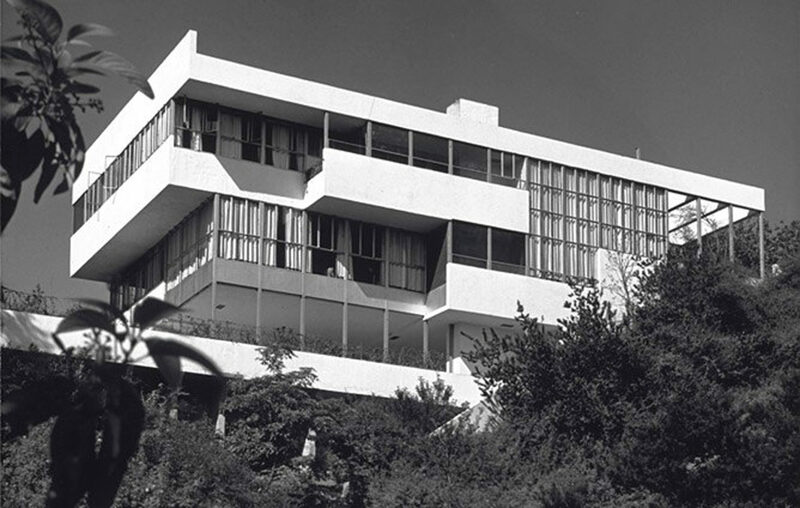 Whereas Vienna symbolized the birth of psychoanalysis, Neutra’s contemporary Los Angeles illustrated the way in which it penetrated society in the years thereafter. When Neutra established himself in the city in 1925, he bore witness to an unprecedented popularization of Freud’s ideas. And if there was one place where these ideas were embraced to the fullest it was surely Hollywood. No coincidence, then, that Neutra found some of his most valuable clients there. Neutra carried out lengthy intake procedures and produced comprehensive files about the daily routines and social habits of his clients. Soon he developed a reputation as an architect that understood how to probe the deeper layers of life. His designs appeared in Palm Springs and Santa Monica Beach, along Sunset Boulevard and Mulholland Drive, built mostly for writers, producers, directors and actors. As Thomas Hines has highlighted, almost all of his Los Angeles houses of the thirties and forties were connected to Hollywood and the film industry. Richard Neutra working in Beard house, Altadena, California, 1935. College of Environmental Design, California State University Pomona. Around this time you begin to see a recurrence of certain design features that eventually coalesced into a set of principles. Of particular importance was the prevalence of walls made entirely out of glass. This was not just to offer panoramic views, but also to describe vectorsfor projection and to organize the flow of energy throughout the house. Neutra termed this the pulse. His designs focused on glass corners and it was at these corners ‘where instability and insecurity collect, and where desires are projected onto’. Within this scheme, the position of the house in the landscape was of the utmost importance. Not just because of the open horizon and the view, but also because of the natural energy of the place. There are stories about how Neutra took to flying at night to inspect locations by moonlight, and about excursions he made with his clients through the forest in order to explore the energetic potential of a particular place. It is easy to imagine how California’s exotic landscape was perhaps the perfect setting for his obscure brand of psycho-physical architecture. 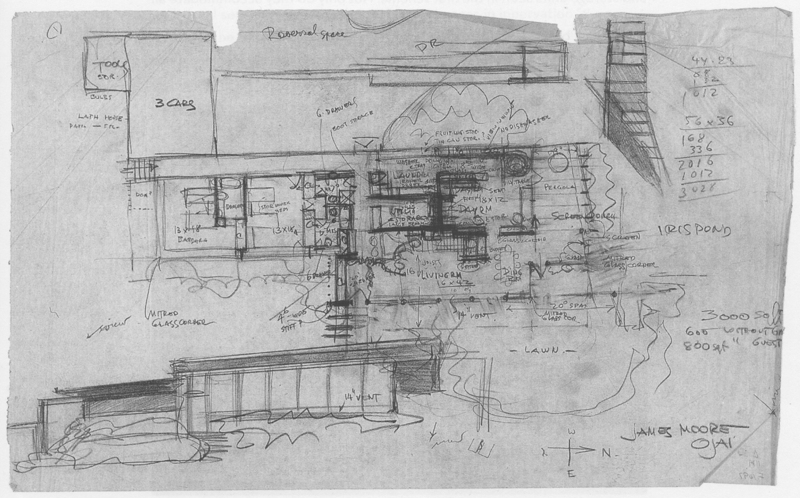 Moore house, Ojai (CA), Sketch, around 1950. In the fifties Neutra’s vision matured. This is made clear by projects such as the Perkins house of 1955 or the Chuey house a year later. What characterized this development was the way in which these houses sought to manipulate the senses. Through elements that move uninterrupted from inside to outside, like the ‘spider legs’ – extended ceiling beams that are fixed into the landscape. Or the exterior overhang above the terrace with a pool that lies partly inside and partly outside. The micro-climate, warmed by heaters, with bushes and plants along the water on both sides of the glass. Outside, silver paneling and the reflection of the pool in front of the house generate further doubling and perceptual confusion. A spatial continuum emerges, in the words of Sylvia Lavin, an unbounded environment ‘oscillating between opacity and transparency, interiority and exteriority, solidity and fluidity’. 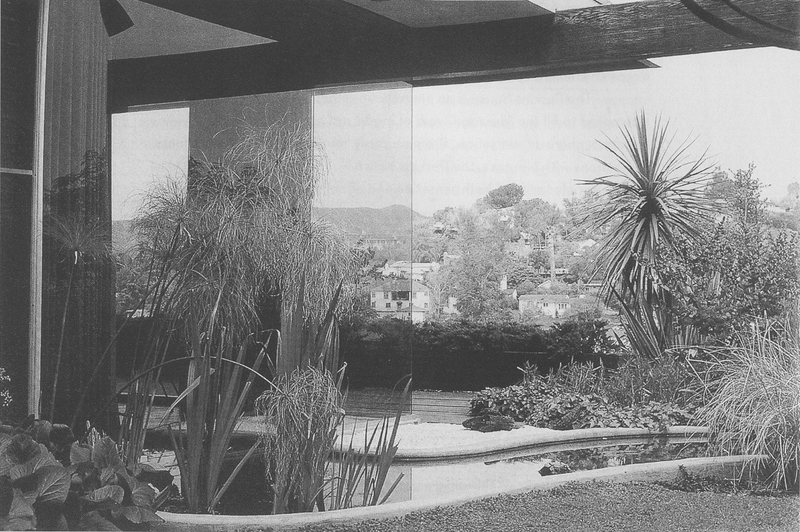 This reflection illustrates the romantic and eclectic character of Neutra’s modernism. At the same time, the notion of space as a ‘field’ filled with energy – derived from physics – was a popular one within the contemporary psychology. Gestalt, the latest brand of form-psychology, viewed the psyche and its environment as a dynamic and interactive whole, and Neutra stretches this insight to cosmic proportions. In an odd mix of Wundt, Freud and Gestalt, he embraced the principles of projection and psychic energy, stirred them with the new notion of ‘environment’, and made it all part of his cosmic ecology. It is easy to dismiss Neutra’s eclectic thought as merely a curiosity. But in our time of seamless connectivity his proposition makes for an interesting case, not least because it poses an alternative to the idea of body and architecture as container-in-a-container. 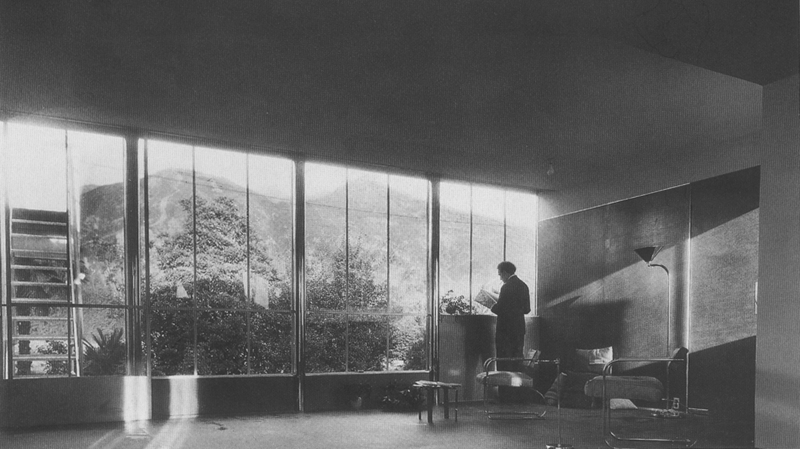 As an architect of environments and atmospheres Richard Neutra is an innovator. And a pioneer of what nowadays would be called environmental psychology. Still, there was never any evidence of his architecture’s therapeutic or healing effects, despite his claim to the contrary. And while Neutra’s houses affect mood and create atmosphere, they fail miserably at curing neuroses. Although many of his clients praised their Neutra home, not all of them were entirely sold on his vision. It is difficult to live in a glass house. Constant visibility from both sides of the glass results in constant exposure, and problems trying to recede from such exposure were an inevitable side-effect. “From the inside of a Neutra house,” one resident said “one has the feeling of being outside inside, if you get what I mean. That’s my trouble with Neutra. I don’t want to be outside. I don’t want to be one with my neighbors”. Transparency is a common trope in modernism. Yet in Neutra’s hands it is not so much a symbol of spatial hygiene, but rather of the open, seamless connection with the environment. This kind of transparency carries an imminent threat. As the resident suggests, becoming one with your surroundings – the loss of a sense of difference – can lead to disorientation. The spaces in and around the house are quickly filled with spatial phobias similar to those experienced in the modern city. The fear of becoming consumed or absorbed. The fear of being watched. The fear of a vast, open space – nature – staring back at you. What could be less therapeutic than that? 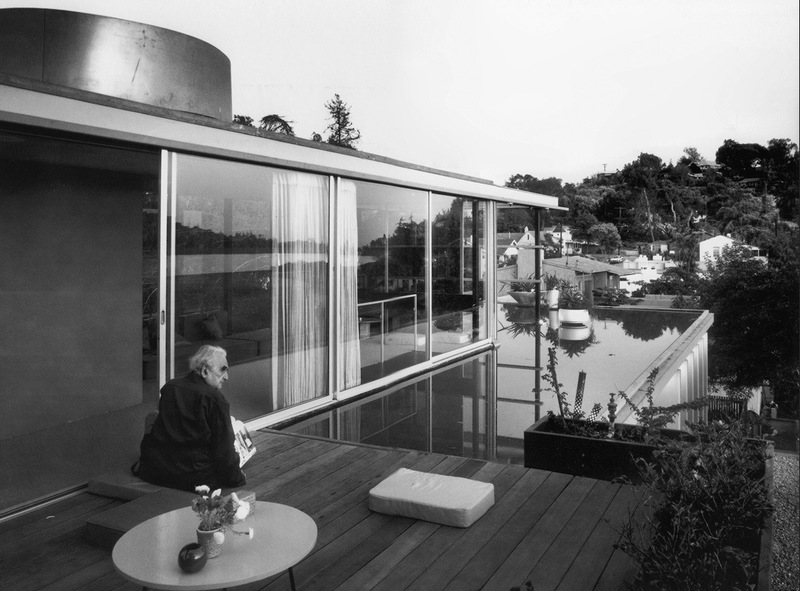 Richard Neutra outside the rooftop penthouse at the VDL Research House II in Los Angeles, 1966. Maarten Overdijk researches urbanism and psychology. He holds a PhD from the research centre for learning in interaction, Utrecht University, and was a resident at the Rijksakademie voor Beeldende Kunsten, Amsterdam.